Why do some people prefer blue and others red? Some individuals are more sensitive to longwaved colors and would benefit from an adapted sensory experience. 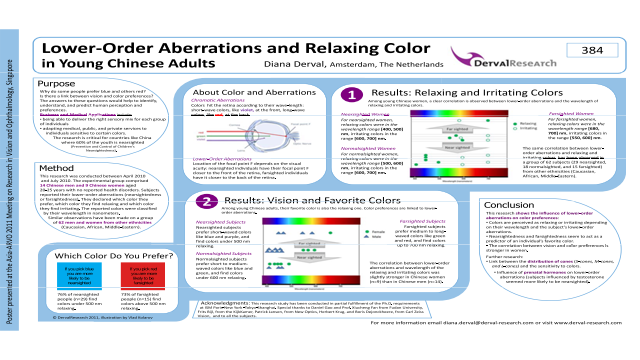 The objective of this research was to study the impact of lower-order aberrations on color preferences among young Chinese adults. The experimental group comprised of 14 Chinese men and 9 Chinese women aged 20-25 years with no reported health disorders. Subjects reported their lower-order aberrations: nearsightedness or farsightedness. They declared which color they find relaxing. The reported colors were classified by their wavelength in nanometers. Among the 23 young Chinese adults, nearsighted subjects found short-waved colors like blue and purple relaxing. Farsighted subjects found medium and long-waved colors like green and red relaxing. This correlation between lower-order aberrations and wavelength of the relaxing color was stronger in female than in male subjects. Similar observations have been made on a group of 20 Indo-European adults, were the relaxing color was also the favorite color.